Storytelling done well is vital for branding – but what happens when you intentionally lose the plot? The opportunity to produce an emotionally-resonating online video, in support of the new strategic positioning for the St. Petersburg Economic Development Corporation (EDC), both challenged and inspired us to abandon prescribed dogma around storytelling: the chronological construction of a plot, the exposition, the stumble and rise of the protagonist, and that glorifying ‘hero’ moment when the entire journey is encapsulated in hard-won victory (perhaps with a brief nod to the corporate sponsor). The art of traditional storytelling is a proven formula because it works. It’s familiar, standard – expected even. Yet, the St. Pete EDC brand rightly embodies none of these qualities, commanding a fresh, somewhat contrarian, treatment. The “Become St. Pete” spot is evolution in a fast straight line, with no overt start to finish. Bridging and overlapping the distinguished threads that bind our corporate ecosystem – creativity, curiosity, innovation, and energy – the corresponding obstacles of stagnation or inertia are overruled before the cameras start rolling. The protagonists are as diverse as their talents and motivations, as separate visual frames are interwoven to reveal a powerful tribe. The wise sage, traditionally inserted mid-story as the omnipotent mentor or savior, instead transcends persona, resonating within a pervasive undercurrent throughout the spot. This sage is expressed as the expansive foundation of our city – with its majestic skyscrapers, bustling breweries, and sandy volleyball courts – drumming an inaudible beat of opportunity that feels both timeless and urgent. From an narration standpoint, there are no linguistic crutches, no uttering of ‘work/life balance’. Instead, with quiet confidence and cheeky irreverence, our storyteller delivers intermittent quips that weave a tale where vocation and lifestyle seamlessly converge. He sells nothing; instead he extols a newly-inverted version of Maslow’s pyramid: self-actualize first, the rest will take care of itself. 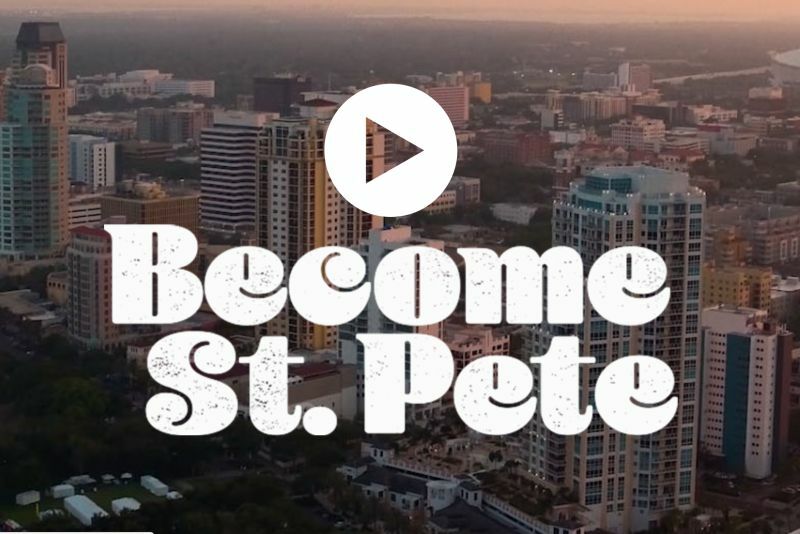 The starring cast of “Become St. Pete” features a mix of fast-growing startups, entrepreneurs, civic organizations, and corporate leaders immersed in meaningful work within some of the city’s key industries: healthcare, marine sciences, financial services, tech, and art/design. During filming, our authentic non-actors took to the stage with hands-free scripts and a singular director’s cue: “show us what you love to do”. This freedom, combined with the liberating extraction of the storytelling framework, celebrates the authenticity of the EDC position: we are becoming the St. Pete story, together, every day.